Once in my previous job, one of my colleagues used to complain about the lack of blue skies in the region…He flew from South Africa to the Gulf region, what did he expect in a world where summers get so hot, Alarabiya news once reported a video showing people frying an egg on the road? Of course, the sky isn’t blue because the hot sun dispels the blueness out of it. But we stereotype for a reason; it makes our lives easier. If we didn’t stereotype, we’d always study a new design of a door knob suspiciously wondering what it was. But we understand that due to its location on a door, that thing is probably a door knob not a door blob. The danger happens when we extend this stereotyping to people, putting them into tiny, tiny boxes and labeling these tiny, tiny boxes using tiny, tiny words. Because if we look at ourselves, we are very complex beings. Yet we fail to acknowledge the same thing about others. They’re either good or bad, kind or evil. We would like to believe we know how we would behave in a particular situation, and yet the truth is, we don’t know unless we find ourselves in that situation. The other day I came to the realization that I don’t like overly sweet/friendly/perfect people. My first reaction is, what are they trying to hide? My second reaction is to run the other way. During one of our psychoanalytical sessions, I realized I’ve been burnt by this personality more than once. In front of your face they’re all sweet and friendly. Behind your back, they’re totally different people. And I end up feeling stupid because I ask myself; how did I not see it coming? But that’s blatant stereotyping over there and maybe I need to change that about myself. So here’s a conclusion; As much as we would like to simplify things and pretend to be rational beings, we’re not. We’re complex beings who experience the world in totally unique ways. As I mentioned in “Reflect on Your Defining Moments”, we’re the triple integration of our personal values, experiences and social conditioning. So celebrate your unique and complex being, and acknowledge that others are unique and complex as well…. And that the sky is not always blue. Also, check out my short story collection, “All Bleeding Stops and Other Short Stories from the Kenyan Coast,” and the non-fiction book summarizing a lot of ideas in the personal development field if you want to change your life but don’t know where to start, “Mine your inner resources”. This entry was posted in Interesting discussion, Life Lessons, Personal Development and tagged Life, personal development, personal growth. Do you want to improve your life but don’t have time to read books on productivity and personal development? 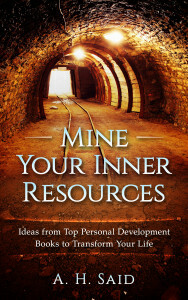 Get your own copy of “Mine Your Inner Resources” for only 5 USD. This ebook synthesizes ideas from the top books in the field of personal development and presents them in an easily digestible way so you can start taking action immediately. It will help you unearth your values, reprogram your thinking, set goals and achieve them. For the Kindle version, click here. For M-Pesa Purchases, send 500 KES to Till Number 121388, send an email to ahechoes@gmail.com with your transaction number and the email address you want to receive the ebook copy and I’ll send the PDF. This entry was posted in books, Life Lessons, Personal Development, Reading, Uncategorized and tagged books, Life, personal development, personal growth, self-help.